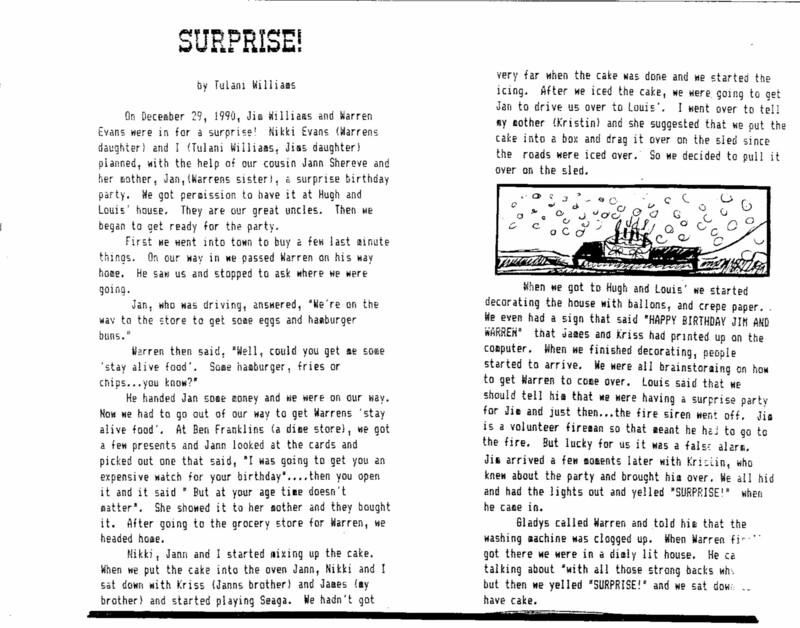 On December 29, 1990, Jim Williams and Warren Evans were in for a surprise! Nikki Evans (Warren’s daughter) and I (Tulani Williams, Jim’s Daughter) planned, with the help of our cousin Jann Shreve and her mother Jan, (Warren’s sister) a surprise birthday party. We got permission to have it at Hugh and Louis’ house. They are our great uncles. Then we began to get ready for the party. First we went into town to buy a few last minute things. On our way in we passed Warren on his way home. He saw us and stopped to ask where we were going. Warren then said, “Well, could you get me some ‘Stay alive food’. Some hamburger, fries or chips….you know?” He handed Jan some money and we were on our way. Now we had to go out of our way to get Warrens “stay alive food”. At Ben Franklin’s (a dime store), we got a few presents and Jann looked at the cards and picked out one that said, “I was going to get you an expensive watch for your birthday:…Then you open it and it said “But at your age time doesn’t matter”. She showed it to her mother and they bought it. After going to the grocery store for Warren, we headed home. Nikki, Jann and I started mixing up the cake. When we put the cake into the oven Jann, Nikki and I sat down with Kriss (Jan’s brother) and James (my brother) and started playing Seaga. We hadn’t got very far when the cake was done and we started the icing. After we iced the cake, we were going to get Jan to drive us over to Louis’. I went over to tell my mother (Kristin) and she suggested that we put the cake into a box and drag it over on the sled since the roads were iced over. So we decided to pull it over on the sled. When we got to Hugh and Louis’ we started decorating the house with balloons, and crepe paper. We even had a sign that said “HAPPY BIRTHDAY JIM AND WARREN!” that James and Kriss had printed up on the computer. When we finished decorating, people started to arrive. We were all brainstorming on how to get Warren to come over. Louis said that we should tell him that we were having a surprise party for Jim and then…the fire siren went off. Jim is a volunteer fireman so that meant he had to go to the fire. But lucky for us it was a false alarm. Jim arrived a few moments later with Kristin, who knew about the party and brought him over. We all hid and had the lights out and yelled “SURPRISE!” when he came in. Gladys called Warren and told him that the washing machine was clogged up. When Warren finally got there we were in a dimly lit house. He came in talking about “With all these strong backs why… ” but then we yelled “SURPRISE!” and we sat down to have cake. I have relatives with birthdays around Christmas. They always feel a bit overlooked. I'm glad you thought to surprise your relatives on a day other than Christmas or New Years. My husband Jim's birthday party is a regular part of the practically non-stop holiday festivities at our house these days. We're all sort of glad to see January 3rd arrive! You’re welcome! Wish we’d had ruff draft going in the 1960s so we could have a better record of our lives.